Jack T. Cook was born and raised in Daytona Beach, Florida. Although he excelled both academically and athletically, his desire to serve his country drove him to graduate early from high school and enlist in the United States Marine Corps at the age of 17. During his time in service, Mr. Cook traveled to over 40 countries and was meritoriously promoted to every rank. Mr. Cook had the honor of serving with elite forward deployed units, often dubbed the “tip of spear” due to their ability to be on target within hours of receiving orders. Mr. Cook was honorably discharged at the rank of Sergeant in 2004. Following discharge from the military, Mr. Cook obtained a bachelor’s degree in History from the University of North Carolina in Wilmington, and relocated to the Central Florida area where he worked as a public school teacher and wrestling coach while pursuing his doctorate at the University of Central Florida. After taking a summer job as an Investigator with Morgan & Morgan, Mr. Cook immediately became immersed in the law and enrolled in law school. The gravitational pull to personal injury law was similar to what drove Mr. Cook to enlist in the Marine Corps: a desire to protect the people against the powerful. Mr. Cook specializes in Medical Malpractice including matters involving Birth Injuries, Surgical Errors, Misdiagnosed Cancer, Cerebral Palsy, and delay in diagnosis and/or treatment of stroke, heart disease and blood clots. Previously, Mr. Cook represented the interests of physicians, physician groups, hospitals and skilled nursing facilities (nursing homes), but has since devoted his practice to the representation of injured patients and their families. Mr. Cook enjoys the unique experience of having litigated cases from both perspectives, and uses his vast knowledge of the legal-medical landscape to seek justice on behalf of those who have suffered injury or wrongful death at the hands of a negligent healthcare provider. Medical errors are now the 3rd leading cause of death in the United States despite the fact that the overwhelming majority of medical malpractice goes unreported. The fact of the matter is that most doctors, nurses, hospitals and medical facilities do remarkable and lifesaving work on a daily basis, and always adhere to the standards of practice learned through their education, training and experience. However, there are healthcare providers who ignore these standards, take shortcuts, ignore patient complaints, and make decisions that are unreasonable. Unfortunately, the result of this negligent care and treatment is very often catastrophic injury or death - Jack T. Cook, Esq. Mr. Cook has been certified as a member of the Multi-Million Dollar Advocates Forum, an organization which is recognized as one of the most prestigious groups of trial lawyers in the United States. Membership in this organization is limited to attorneys who have won million and multi-million dollar verdicts, awards and settlements. Less than one percent of attorneys in the United States are members. In 2018, Mr. Cook received a Lifetime Achievement selection to America’s Top 100 Attorneys®, an invitation only selection reserved to identify the nation’s most exceptional attorneys whose accomplishments and impact on the legal profession merit a Lifetime Achievement award. Selection is not achieved based on a single accomplishment or a single great year of success, but rather on a lifetime of hard work, ethical standards, and community enriching accomplishments that are inspiring among the legal profession. To help ensure that all attorneys selected for membership meet the very high standards expected for selection, candidates for lifetime membership are carefully screened through comprehensive Qualitative Comparative Analysis based on a broad array of criteria, including the candidate’s professional experience, lifetime achievements, significant case results, peer reputation, and community impact. 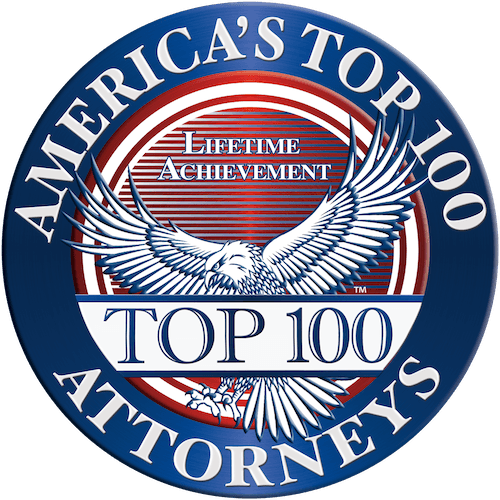 With these extremely high standards for selection to America’s Top 100 Attorneys®, less than one-half percent (0.5%) of active attorneys in the United States will receive this honor. Mr. Cook resides in the Dr. Phillips area with his wife, Sandra, and their two children, Chase and Lorelei. In addition to practicing law, Mr. Cook is an accomplished singer, having fronted numerous bands throughout Florida, and having performed with the Orlando Opera Company.